My first official task of the week was to represent the Company at the Annual National Service for Seafarers held at St Pauls. In reality, the Company was rather more conspicuously represented by our two apprentices, Charlie Irwin and Andrew Heath, who carried the Company’s colour in the procession of Flag Bearers which also included our Barge Master Robbie Coleman. Prior to the service, Susan and I had correctly identified the school children consuming vast quantities of chocolate and confectionery in Paternoster Square as the choir. The grandeur of St Paul’s, a Royal Marines Band, and a packed congregation cannot fail to make a wonderful service, but in the event we didn’t get to hear much of the choir because they were drowned (if that’s not an inappropriate word in this context) by the elaborate and thunderous arrangements played on the Grand Organ. Pupils from Pangbourne College and a Naval rating contributed to the service and none seemed daunted by the occasion. We all left feeling uplifted and grateful to those “who follow the calling of the sea”. The following day, the 11th, there were two internal meetings at the Hall. The first Working Party brought together the representatives of two of our main sources of funds (other than the subscriptions): the PQs and those intending to leave legacies to the Company. Those subscribing as PQs make small, regular contributions to finance major refurbishments or improvements, so there was a review of the potential projects and the associated costs. Regarding legacies, the Company has resolved to keep these in a separate fund to build up the resources of the Company, but to spend the notional interest for the benefit of all Freemen. The Working Party will draw up some plans and in the meantime it was agreed that all Freemen should, within their means, be encouraged to support the Company’s various charities and funds. The second meeting was the first for the Editorial Panel tasked with producing Volume 6 of the Company’s History. Volume 5, published in 2008, took the history up to 1921, so the Panel first tried to resolve how far the next volume should take us. It was decided that the creation of the National Dock Labour Board in 1948 was probably a reasonable point but further research would be done. The Panel also considered whether the format should remain the same as the previous five volumes, given that we were now moving into an era when there were far more photographs and personal memories available. Again, more research was deemed necessary. That same evening I went to a lecture at Bakers’ Hall organised by the Worshipful Company of Marketors. The subject was Marketing in the 21st Century and the main effect was to prove to me how far marketing has moved since I worked in advertising in the 1980s and 1990s! The vocabulary and channels have changed completely, but fortunately at the following reception I found a number of kindred spirits among the Marketors so we could exchange anecdotes about how it used to be. On the Friday I attended a River Thames Lunch at the Hall to host the “Nauti Group” of representatives of the Shipwrights, the Master Mariners, Trinity House and ourselves. As always the meal provided by Cook & Butler was excellent (five courses with wines included) and our table reviewed a number of topics of mutual, water-related interest. On Sunday 14th, Susan and I, along with several representatives of the Company, attended the Fish Harvest Festival service at St Mary-at-Hill. 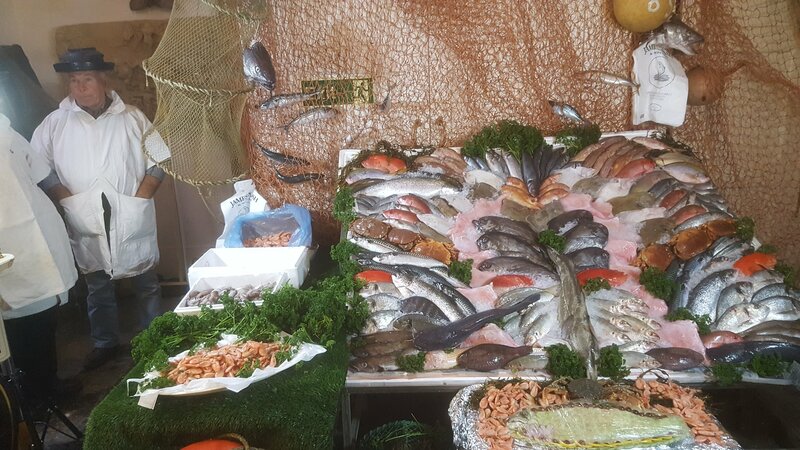 On arrival we inspected the impressive display of fish and shellfish provided by a team from Billingsgate Market, before proceeding to Choral Matins led by the Revd Rose Hudson-Wilkin and accompanied by the very professional St Mary-at-Hill choir. After the service it was possible to buy the fish but, mindful that we had to go on to another two engagements, Susan and I resisted. The immediate engagement was lunch at the Hung Drawn & Quartered organised by the Billingsgate Ward Club, which we had to leave promptly to go to Putney for the Thomas Martyn Foundation service. Not much is known about Thomas Martyn’s early life, but it appears that as a child he fell into the river at Putney and was rescued by local Watermen and, to show his gratitude, he made provision in his Will of 1684 to endow a school for the sons of Watermen. The first school opened in 1718 but was demolished in 1887 to make way for Putney Bridge, and the succeeding school moved several times before finally closing as a separate entity in 1911. Today the Thomas Martyn Foundation exists as a charity giving financial grants to the Foundationers: the sons and daughters of licensed Watermen. This year’s events started with a service at St Mary’s Church Putney attended by the charity’s trustees, representatives of the Company, and the Foundationers’ families. 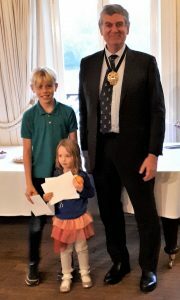 We then moved to London Rowing Club for refreshments and the presentation of the grants and the traditional healthy oranges. The first Freemen’s Lunch of the year on Tuesday 16th was attended by nearly fifty Freemen and their guests. We were delighted to welcome our former chaplain, Craft Owning Freeman the Very Revd Bertrand Olivier, now the Rector of Christ Church Cathedral and Dean of Montreal. Other guests included Robert Hulse, Director of the Brunel Museum at Rotherhithe, Paul Rochfort, Past Master of the Gardeners, and Archie Norman, Past Prime Warden of the Shipwrights. The principal guest was Peter Steen, the PLA’s Director of Marine Operations who spoke informatively – and very amusingly – about his career and current role. That evening I attended the Installation Dinner of the Worshipful Company of Fuellers, a company with which we have a long association through the Lighterage. The dinner was in the Great Hall at the Skinners’, which was filled to capacity with 170 dining. The incoming Master of the Fuellers Mr Shravan Joshi hosted the evening with an Indian theme including the menu, music and principal guest, the Lord Ghadia. On the afternoon of Wednesday 17th I attended the Thames and London Waterways Forum. The Mayor of London wants to encourage greater use of the river to transport passengers and freight and has set up a number of working groups. The Company was well represented along with a number of river operators and other interests. We heard presentations from each of the three Working Groups: passenger, freight, and cultural & environmental. The three minor presentations that followed featured inspiring examples of what is being achieved in the key priority areas: the new Woolwich Ferries, the development of Albert Island, and the Illuminated River. The Q&A sessions raised a number of topics of interest to the Company including the Safeguarded Wharves, strategic boatyards and the proposed Rotherhithe Bridge. That evening the Clerk and I dined at Apothecaries’ Hall at their Court Dinner. This was a much smaller, private dinner with only a few Masters and Clerks as guests of the Court and no speeches. I had a very convivial evening sitting with several Past Masters of the Apothecaries and the Master Brewer. The following evening was another full Livery dinner with the Worshipful Company of Actuaries at Clothworkers’ Hall. I had a splendid evening, feeling especially honoured to be seated on the top table between the Master, Mr Nick Salter and his wife Susie. The principal guest was the Chief Magistrate, Baroness Arbuthnot, who recalled her career at the Bar and especially her early appearances at Bow Street Magistrates Court. It was a memory I could share because in my early Regimental career junior officers were required to appear with any guardsman or soldier appearing before the magistrates. The cells were truly Dickensian and the climb the accused took to the Dock was dauntingly steep, sadly now all gone and soon to become a luxury hotel. The following week was relatively free of official duties and this seemed true across all the Livery Companies. Someone suggested it had something to do with the schools’ half term but there seemed no confirmation, and Susan attended two Consort events during the week which would seem to confound that theory.